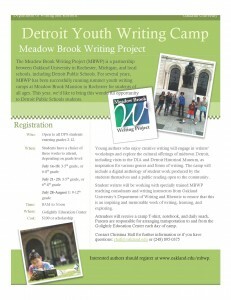 Parents: Have your child join the Detroit Youth Writing Camp Meadow Brook Writing Project! The Meadow Brook Writing Project (MBWP) is a partnership between Oakland University in Rochester, Michigan, and local schools, including Detroit Public Schools. For several years, MBWP has been successfully running summer youth writing camps at Meadow Brook Mansion in Rochester for students of all ages. This year, this wonderful opportunity is coming to Detroit Public Schools students. Young authors who enjoy creative writing will engage in writers’ workshops and explore the cultural offerings of midtown Detroit, including visits to the DIA and Detroit Historical Museum, as inspiration for various genres and forms of writing. The camp will include a digital anthology of student work produced by the students themselves and a public reading open to the community. Attendees will receive a camp T-shirt, notebook, and daily snack. Parents are responsible for arranging transportation to and from the Golightly Education Center each day of camp. questions: chall@oakland.edu or (248) 895-0375. Interested authors should register at www.oakland.edu/mbwp. Who: Open to all DPS students entering grades 3-12.